Inevitably, we associate the Swiss Alps with wild, untamed nature, majestic mountains and glaciers, wild mountain streams and lonely farms. Until now, only a handful of nature enthusiasts and experts have known the great extent to which these mountains have been affected and changed by human mobility from time immemorial. Likewise, that nature and technology have formed fascinating symbioses and that many natural landscapes first had to be made accessible for man is unknown to many. The picture painted, for example, by Goethe and the romantic painters of Via Mala as the wild origin of the River Rhine seems to still dominate our view. Yet, it is exactly these mountainsides of Via Mala that reveal to the expert eye how, century after century since the Celts and the Romans, and generation after generation since 1800, paths and roads have been cut through nature; on different sides and at different heights of the glen with different tunnels and serpentines. 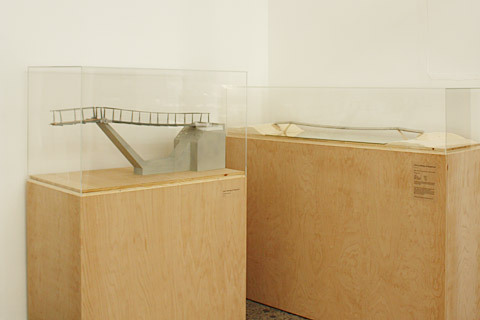 Also at the Biennial's Swiss Pavilion, Via Mala, or rather the models of two footbridges across Via Mala, feature as the starting point of the "Landschaft und Kunstbauten" exhibition by the renowned engineer Jürg Conzett from Chur. Some years ago, he created one bridge each at the German-speaking (Germanic) and Rhaeto-Romanic end of Via Mala. One is unusual and made of wood, while the other is an even more unusual suspension bridge with stone boards, which reflect their location as well as the culturally different traditions of house building on the two sides of the Alps. Conzett's first wooden bridge was soon to become victim to a rock fall, which meant that it had to be rebuilt as a different, yet no less successful, construction. 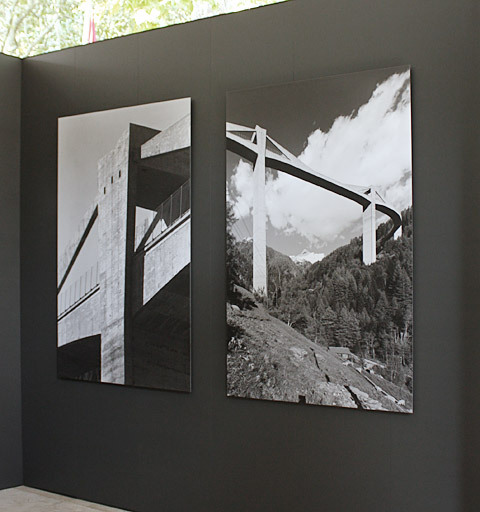 These bridges are a good example of the interplay between nature and technology and, at the same time, a great start for an exhibition in which Switzerland, once more, has taken its very own approach - independently of the Biennial's overarching theme. The theme and manner of realization of this rather educational exhibition are strikingly different from other national contributions. 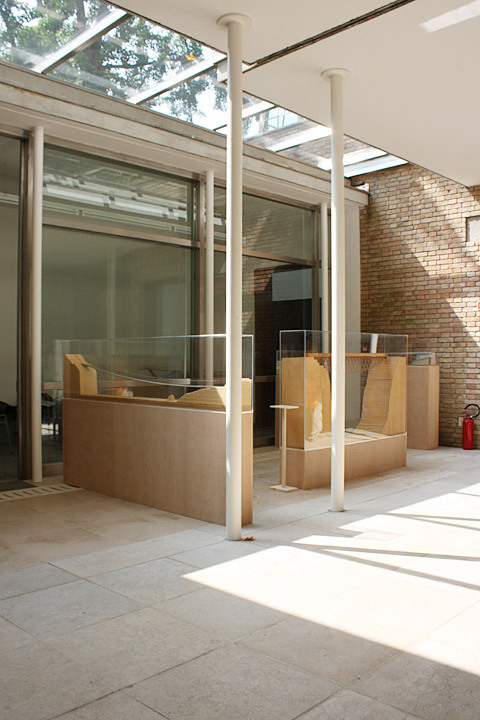 During the opening days, quite a few architects seemed slightly irritated and surprised that the pavilion was curated not by an architect, as would seem fitting, but instead by a civil engineer. 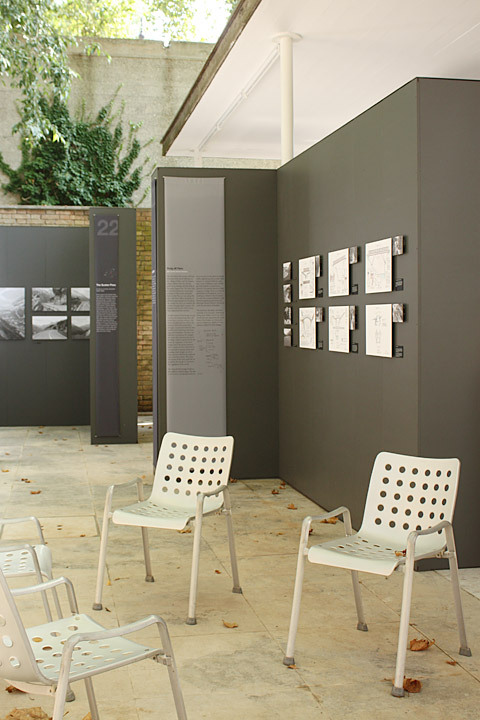 Visitors are not welcomed to the Pavilion's 23 unimposingly gray chambers by visual fireworks or expansive installations, but by a tranquil series of impressive black-and-white photographs complemented by numerous texts and few models. Together with the photographer Martin Linsi, Jürg Conzett chose more than 40 technical constructions in the Swiss landscape, mostly bridges, but also supporting walls and river steps - structures of remarkable quality developed in Switzerland since the 18th century. 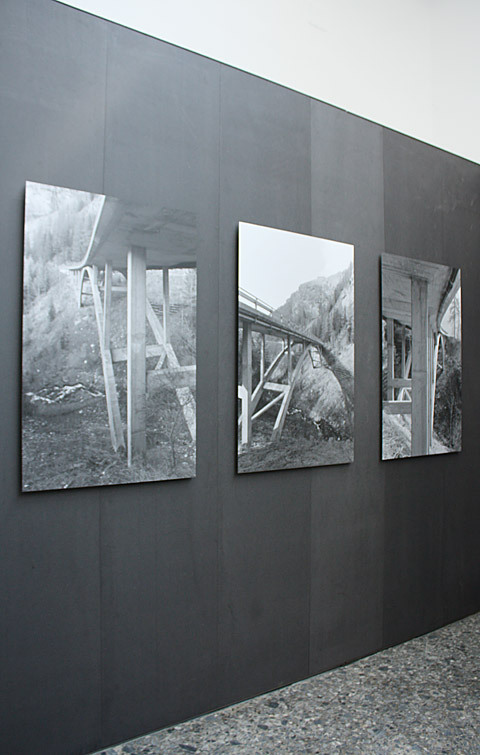 The exhibition is presented as a strictly chronological sequence, following the dates when the constructions were built and, simultaneously, following the course of half a year starting in the wintery village of Sittertobel situated between St. Gallen and Herisau and ending in early summer on the Susten Pass and the newly designed hiking path "Trutg dil Flem" near Flims. In the true sense of the word, visitors are offered a monumental image of Swiss landscapes and their technical constructions, a kind of declaration of love to the engineer's home country and the creative possibilities of technology. 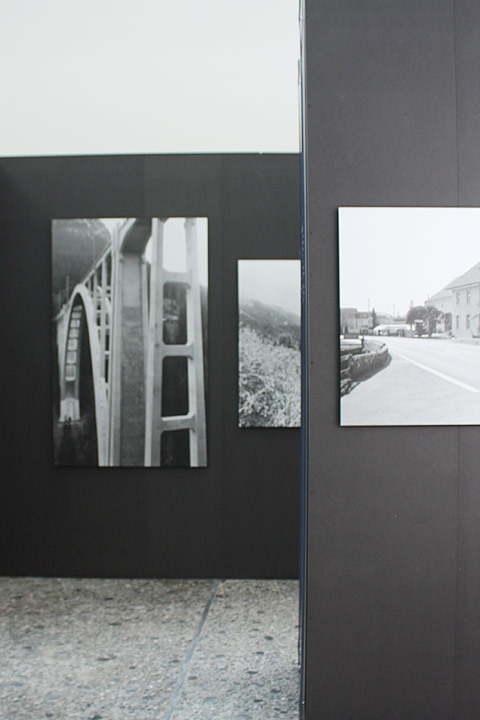 Even though the 20th century dominates, visitors also get to know about the changes in bridge building and those who created them, about the ideas and goals of pioneers such as Johann Ulrich Haltliner, Alexandre Sarrasin, Robert Moser and Robert Maillart. Time and again, views of highly elegant and delicate bridges spanning across deep glens open up, majestic panoramas unfold and serpentines are winding through the landscape like organic creatures. Some shots and constructions have heroic appeal, while others stage the supposed serenity of their layout in an almost playful way. Next to massive bridges, there are delicate suspension bridges and widely spanned constructions that seem to fuse with the landscape, while others seem to be implanted in nature as friendly aliens. Thanks to the one or other German autobahn or railroad bridge from recent decades, at least all German visitors were deeply impressed by the high quality and continuity with which Switzerland has been maintaining and expanding its traffic routes. A calm, almost silent plea for a better built environment and the great responsibility we have towards nature and its resources - such is the core message of the exhibition. Wisely, it is not judgmental but above all aspires to be a school of seeing. Those with time and interest not only in enjoying the beautiful, captivating landscape photographs, but also reading the numerous texts will be rewarded with an introduction to the complex world of creative civil engineering. 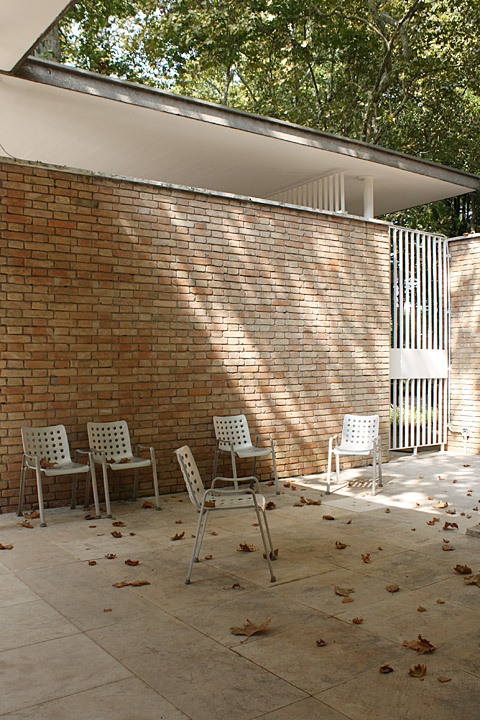 It provides information about the change in building techniques as well as engineers' attempts to integrate sober and functional constructions into a particular landscape and culture. 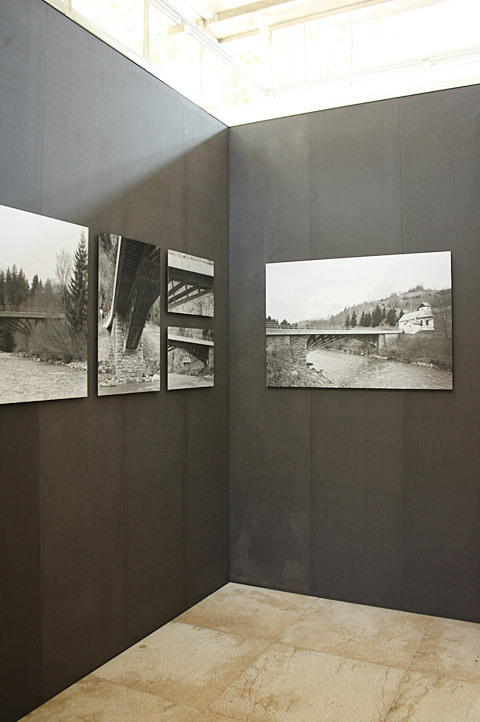 Bridges may serve to reduce long distances and, thus, to accelerate travel times; however, the aim of this exhibition is quite the opposite, namely to decelerate its visitors and remind them of their responsibility for our environment both in words and in pictures.